Residents of some waterlogged neighborhoods told to prepare for another possible round of flooding by moving vehicles to higher ground. The city scrambled to repair fire-damaged equipment at a power plant and shore up its drainage system less than a week after a flash flood from torrential rain overwhelmed the city's pumping system and inundated many neighborhoods. All of the city's public schools were closed Thursday until at least next week. The city's infrastructure had been crumbling for years before the devastation unleashed in 2005 by levee breaches in the aftermath of Hurricane Katrina. Louisiana's governor declared a state of emergency in New Orleans on Thursday as the city's malfunctioning water-pumping system and the threat of more rain left some neighborhoods at greater risk of flooding. Gov. John Bel Edwards described his emergency declaration as a precautionary measure. He and Mayor Mitch Landrieu tried to calm the jangled nerves of residents still angry about the city's response to last weekend's flooding. Landrieu urged residents of some waterlogged neighborhoods to prepare for another possible round of flooding by moving vehicles to higher ground. Jamie Hill, a resident of the Mid-City neighborhood that has flooded twice in the past month, was clearing mud, sand, grass and other debris from the storm drain near her home. Her car flooded in an earlier downpour a few weeks ago. She said she's learned her lesson and now moves her car anytime it rains. "I'm doing what I can, not that it will really matter if the pumps aren't working," she said. The federal government earmarked billions of dollars for repairs and upgrades after the hurricane, but the problems have persisted. Streets are pockmarked with potholes and sinkholes. The city's water system has been plagued by leaks from broken pipes and power outages leading to boil water advisories. 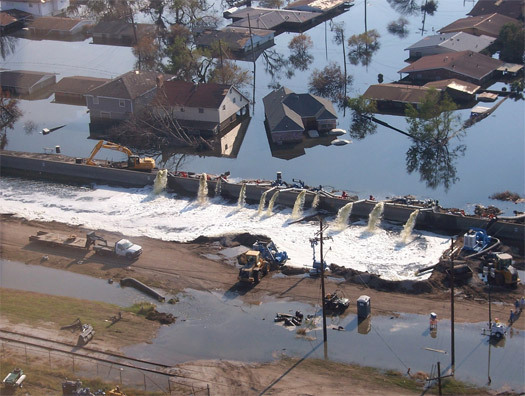 New Orleans' municipal pumping system is supposed to move water out of the low-lying city. Having the system crippled in August could not come at a worse time - the middle of hurricane season - for New Orleans. But officials feared that even a run-of-the-mill thunderstorm would test the system's reduced capacity. "With great prayer and a lot of hard work, hopefully we'll be OK," the mayor said. Landrieu's office said in a news release early Thursday that the city has lost service from one of its turbines, which powers most of the pumping stations that serve the East Bank of New Orleans. He said that means the system's capacity to drain stormwater from the streets has been diminished. "It was an internal fire within the turbine itself, and it was a critical part," Landrieu said The mayor said the city was bringing in generators to back up the system and hoped to have them installed within 48 hours. Earlier, Landrieu said the power available early Thursday wouldn't be adequate to protect the city from another massive rainfall. National Weather Service meteorologist Phil Grigsby said scattered thunderstorms and showers were in the daily forecast for the region through the weekend and into next week. But he called that a "fairly normal pattern" for south Louisiana in August. "We can get a quick band of 1 to 2 inches of rain in an hour. Normally [the pumps] can handle that," Grigsby said. "But with the reduced capacity, it's something we have to keep an eye on." Earlier this week, city officials had said repeatedly that all 24 pumping stations were working at full capacity. But after the system failed to keep up with a storm that dropped 9.4 inches of rain in three hours, the truth about the state of the pumps began to emerge. Contrary to what the public had been led to believe, City Council members were then told that pumping stations in two of the hardest hit areas were limited to one-half to two-thirds capacity on Saturday, news outlets reported. Cedric Grant, one of the mayor's top deputies and head of the Sewerage and Water Board, told the City Council on Tuesday that he would retire at the end of hurricane season, which ends Nov. 30. Public Works director Mark Jernigan submitted his resignation shortly after the council meeting, where he was asked whether his agency had done enough to clean the catch basins that feed the drainage system. Landrieu said he also wanted the board to fire Joseph Becker, the Sewerage and Water Board's general superintendent.